Transitional in style with wide arms, this loveseat can update your living room with simple style. This loveseat has two over two seating making it a great compliment to a coordinating sofa. Throw pillows add comfort and a pop of color. The 957 Transitional Loveseat with Flared Arms by Albany at A1 Furniture & Mattress in the Madison, WI area. Product availability may vary. Contact us for the most current availability on this product. Transitional in style with a versatile look, this upholstery collection can easily update your home. Pieces from this collection feature flared arms and wood block feet. Add a larger rectangular ottoman to the center of your room for a great accent piece. 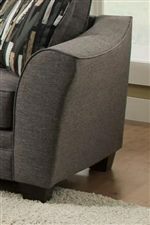 The 957 collection is a great option if you are looking for Transitional furniture in the Madison, WI area. Browse other items in the 957 collection from A1 Furniture & Mattress in the Madison, WI area.